Sean Dyche accepts Burnley will have to be patient in the last couple of weeks of the transfer window, as he looks to add to his squad. The club has until 11 p.m. on Thursday, January 31st to bring anyone in, to help a group which has been stretched all season. 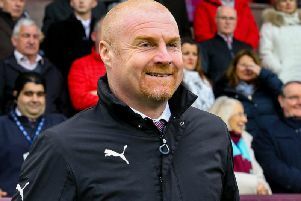 Dyche would have liked or have brought in another two or three players in the summer, to help with the extra exertions of the Europa League. And though injuries are starting to clear up, as his side begin to pull away from danger, ideally he would still like some fresh faces this month. Dyche said: “We’re trying to keep our ear to the ground and keep on top of a few situations that are possibles. “People know where we stand. And any outgoings will he limited, after Jimmy Dunne and Ali Koiki left last week on loan to Sunderland and Swindon Town respectively. However, amid interest from neighbours Accrington Stanley in keeper Adam Legzdins, Dyche admitted: “Certain players won’t be available, but Legz would be. “We’ve had so many injuries, and we’ve been stretched across the board, but after being stretched at the start of the season in goal, we now have five. Dyche is hopeful Johann Berg Gudmundsson (thigh) will be available for the trip to Watford on Saturday, although Jeff Hendrick filled in admirably against Fulham: “I’m still to find out more on Johann, but he will be on the grass, so he’s still a maybe at the moment. “But Jeff did well against Fulham. I’ve said many times we’ve asked a lot of Jeff, we’ve moved him around and he just gets on with it and tries to deliver a performance. And Dyche was boosted as Nick Pope, Steven Defour and Stephen Ward came through an Under 23 run out on Monday: “We were pleased with that, Popey got another game, and hopefully he will get another now. “With Steven, he and we are just making sure, so he did 75 minutes or so, and Wardy did the full 90. “So we’re getting closer again. “We’re still a bit limited, with the full backs, Phil Bardsley has been off the grass for a few days, and Matt Lowton has had a bang on his toe. “But Robbie Brady is available after Saturday, and hopefully by the FA Cup tie, we’ll be looking a lot stronger.